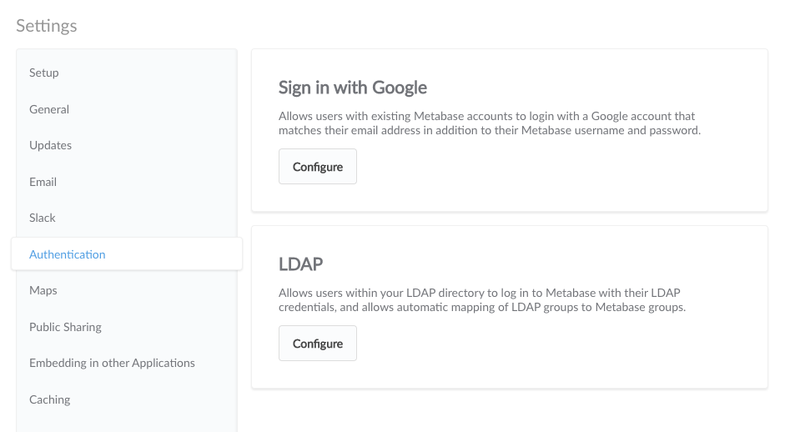 Enabling Google Sign-In or LDAP lets your team log in with a click instead of using email and password, and can optionally let them sign up for Metabase accounts without an admin having to create them first. You can find these options in the Settings section of the Admin Panel, under Authentication. As time goes on we may add other auth providers. If you have a service you’d like to see work with Metabase please let us know by filing an issue. To let your team start signing in with Google you’ll first need to create an application through Google’s developer console. To create a new application follow the instructions from Google here. Now existing Metabase users signed into a Google account that matches their Metabase account email can sign in with just a click. If you’ve added your Google client ID to your Metabase settings you can also let users sign up on their own without creating accounts for them. To enable this, go to the Google Sign-In configuration page, and specify the email domain you want to allow. For example, if you work at WidgetCo you could enter widgetco.com in the field to let anyone with a company email sign up on their own. Note: Metabase accounts created with Google Sign-In do not have passwords and must use Google to sign in to Metabase. If your organization uses LDAP, and you want to allow your users to log in via their LDAP credentials, you can do so as follows. 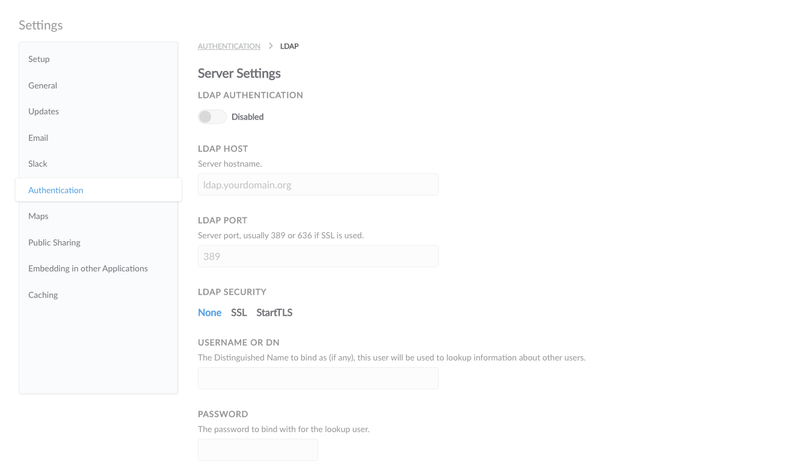 Click the toggle at the top of the form to enable LDAP, then fill in the form with the information about your LDAP server. 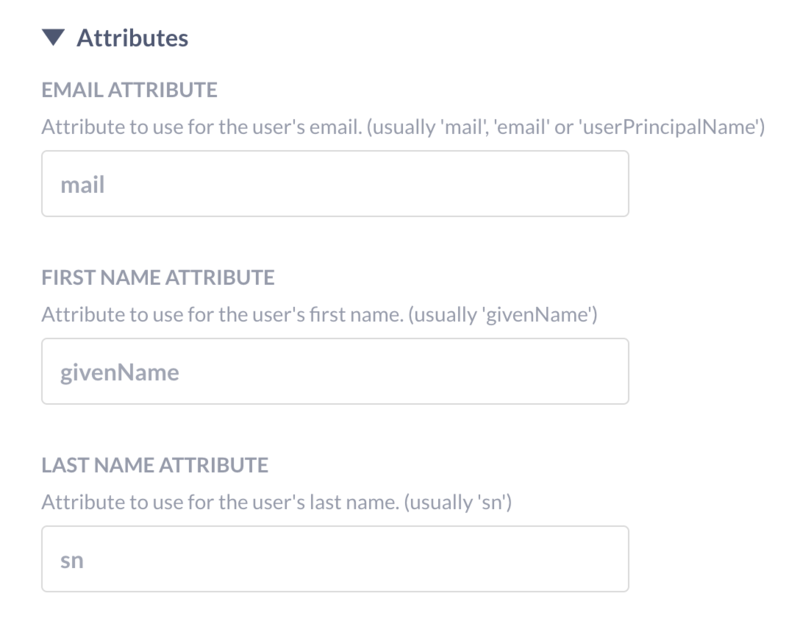 Metabase will pull out three main attributes from your LDAP directory - email (defaulting to the mail attribute), first name (defaulting to the givenName attribute) and last name (defaulting to the sn attribute). If your LDAP setup uses other attributes for these, you can edit this under the “Attributes” portion of the form. If you have user groups in Metabase you are using to control access, it is often tedious to have to manually assign a user to a group after they’re logged in via SSO. You can take advantage of the groups your LDAP directory uses by enabling Group Mappings, and specifying which LDAP group corresponds to which user group on your Metabase server. Find out how to create user groups and define what data they can access with permissions.